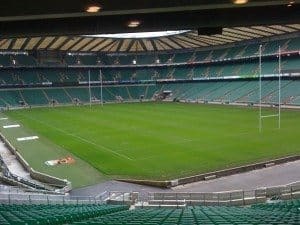 Yesterday I was lucky enough to have a show round Twickenham Stadium, the home of English rugby. The highlight was going down onto the pitch and then heading into the tunnel and through to the England players dressing room. Funny how all the girls headed for the shower/bath area and the lads went to the changing area. 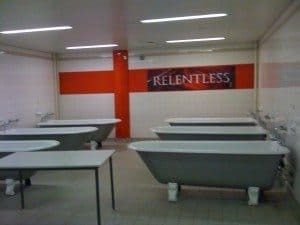 Actually I was very impressed with the roll top baths these England Rugby players engulf themselves in! They were enormous. A mouth watering trio of games. For your hospitality at Twickenham, do click here to see what we have to offer. Whilst there I spent a great deal of time reviewing the new South Stand at Twickenham, the private boxes, the suites but also the private suites offered by the Marriott Hotels. I have to be honest and say that some of the RFU boxes and all the Marriott boxes are right up in the Gods and personally, although very well spec’d out, they are just a little too far up. 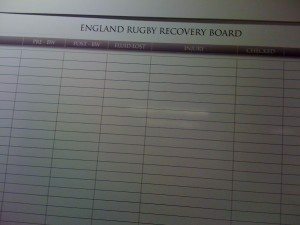 However, it does seem that if you put your name down for a private box at Twickenham, you can request one of the unused annual boxes which are locted further down the twickenham stadium which would be better. First Cab Clue Trail Completed! !